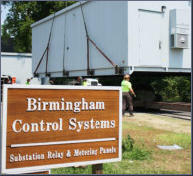 Birmingham Control Systems designs, engineers, and manufactures control panels to protect, monitor, and control electrical distribution and utility equipment utilizing the most current state of art microprocessor controlled relays and monitoring equipment. Solutions for the Automotive, Chemical, Food & Beverage, Pulp & Paper, Water & Waste Treatment, Utilities. A leading provider of Control Panels and Control Buildings for Industrial and Utility Control and Automation.